Not every thirteen-year-old girl is accused of murder, brought to trial, and found guilty. But I was just such a girl, and my story is worth relating even if it did happen years ago. Be warned, however: If strong ideas and action offend you, read no more. Find another companion to share your idle hours. For my part I intend to tell the truth as I lived it. I began the last story about a story by telling how Book A (Something Upstairs) led to Book B (The Man who was Poe). 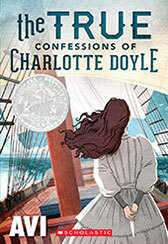 Here is the story how the Poe book led to Book C, The True Confessions of Charlotte Doyle. Poe is generally credited with having invented the detective tale with his short story, Murders on the Rue Morgue. (1841) That story, profoundly influential, also came to be known as a “Locked Room Mystery.” Which is to say something happens in a room that is presumably inaccessible.